Woo Hoo! 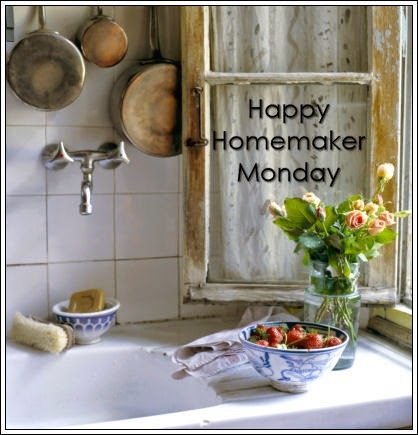 It's time for Happy Homemaker Monday!!! For those new to my blog, Monday is the day I link up with Sandra (and others) over at Diary of a Stay at Home Mom! I really look forward to participating with these ladies on Mondays. I am waayyy past the "stay at home mom" stage and I truly admire moms like Sandra and Carla who are so creative and excel (imho) in the parenting realm. Parenting today is sooo much more difficult than it was when I did it. I watch my daughter with my granddaughter and am awed by the whole experience. Well, I could wax eloquent on parenting for days but so as not to bore you to tears, let's get on with Happy Homemaker Monday, shall we?!!! It's 85 degrees at 10:00 am so I'm thinking HOT today! Time to put the air conditioner in the window, I'm thinkin'. The sky couldn't be bluer and everything is beautiful, green and blooming outside! When I look out my livingroom window, I see Mt. Hood in the distance...beautiful! Thinking about what else I can do to try to get our Rocky back. We called the Kennel (the owner is also one of our neighbors), Sheriff's office, two local veterinarians, placed an ad in the local paper, listed him as lost on the PetLink website (he's chipped). I will most likely make some posters today to put up in the surrounding towns. Books that need to be read; hand lotion; pens and pencils and my iPod. The washing machine doing it's thing! No menu. On Monday, Wednesday and Friday I prepare and eat a 500 calorie meal midday. It's part of my intermittent fasting program. Happening this week:::I am hoping to have a super low-key week! We'll see how that goes! However, Hubby's birthday is on Friday and we are going to brunch on Sunday! Hubby doesn't like a big deal made out of his birthday so brunch on Sunday will likely be it! 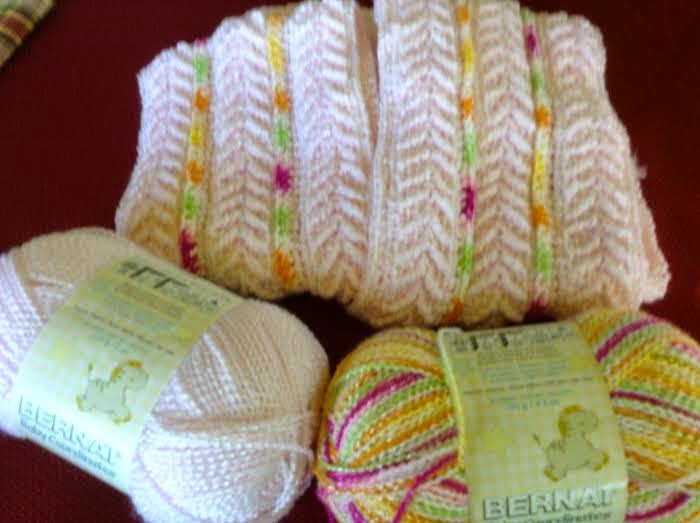 I had three strips finished before leaving for my daughter's on Thursday but left those home. I made three more while riding in the car so need to join all six together today. I love the bold colors with the soft pink. 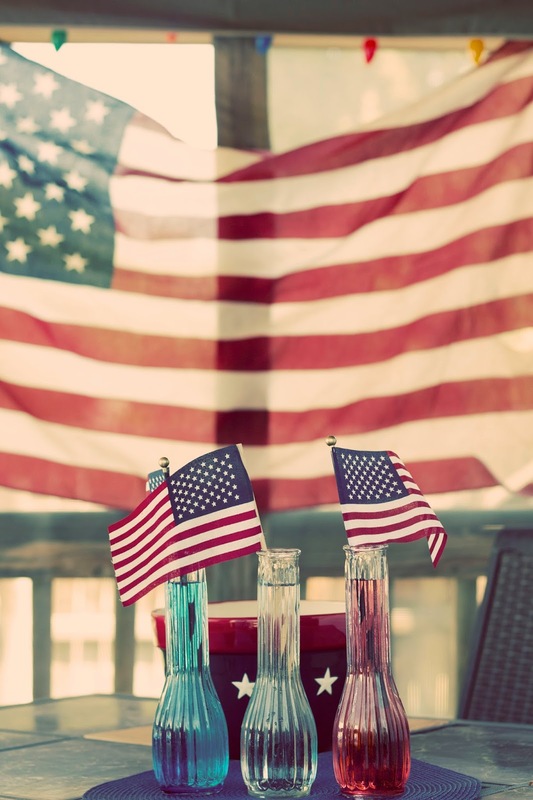 Sitting with an ice cold beverage in hand...just thinking. To clean Glass Shower Doors: Put a teaspoon liquid dish soap (I use Dawn) into Dishwand (the kind with the sponge and scrubby part), add one drop of Jet Dry, fill with water leaving a little space at the top. Tip wand back and forth to mix then scrub away! I also use this on the walls of the shower stall. I just got back last night from being gone for 4 days. Hubby is good at doing dishes but nothing else was done so need to do the floors, dust, clean off the dining room table, do laundry unpack my bags...maybe I'll just take a nap! 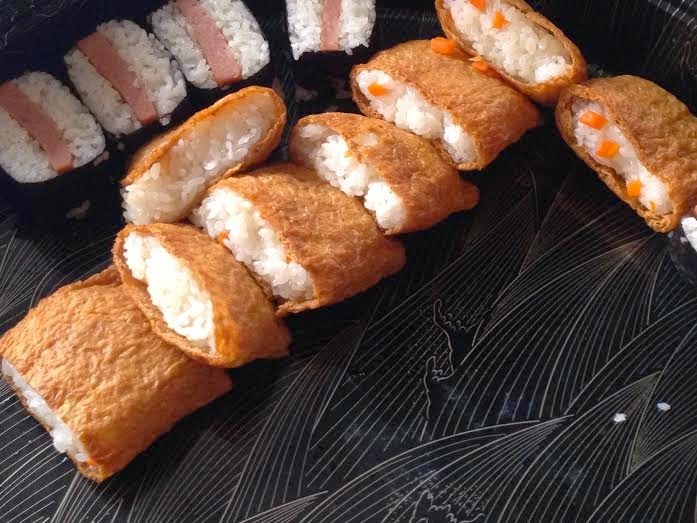 My daughter's mother-in-law makes these super yummy tofu skin pockets filled with a slightly sweetened rice. I LOVE THESE!!! The missing ones? I probably ate them all myself! She also made Spam Sushie (pictured behind) and I was told it was delish! Being a vegetarian, I passed on those. Our precious Rocky to be found...hopefully alive and well. Well, that's it for this Monday! Have a great day and thanks for stopping by! Me too! Thanks for stopping by, Lena! Keep cool in your triple digit heat! The baby afghan looks so pretty. Hope you have a lovely week. I didn't realize how painful this would be. He is such a sweet dog and has sooo much personality! Thank you for your prayers and for stopping by, Sarah! I hope he's found soon too. OH Kat, I hope you really find Rocky, it's such a horrible feeling when a pet goes missing :( I'm praying you find him soon. Thank you as well for the very sweet comments you made about me, I appreciate them so very much. Thanks, Sandra! I didn't realize how attached I was...he is my son's dog but I take care of him all the time. Thank you for your prayers! My blog header was designed using Stampin' Up! 's My Digital Studio. All images are copyrighted by Stampin' Up! I have been a Stampin' Up! Demonstrator for five years. I enjoy paper crafting, sewing, crocheting, knitting, reading and picking berries. I love life and look forward to getting up every morning. I feel blessed to live in a quiet, rural place where we grow a large garden and have beautiful flowers. I believe being bored is a choice and I don't choose boredom. A Little Bit of Happy for Me! Subscribe to My Paper Pumpkin today! New Catalog! Click to view as pdf! Where in the World are my Visitors from? The content in this blog is the sole responsibility of Kathy Skinner as an independent Stampin' Up! demonstrator and the use of and content of classes, services or products offered is not endorsed by Stampin' Up! As a courtesy to me, if you use an idea you have seen on this website, please link back to my website! Thank you!